250 years ago the Hawaiian Islands were completely self-sufficient. The food children ate was from the ‘āina of Hawai’i, literally translated as “the land which provides or feeds us.” Today Hawaii’s modern import culture has taken a toll on young children, especially Pacific islanders who have higher obesity rates than the nationwide average. Guided by initiatives such as Let’s Move! Child Care, one young woman, Tiana Kamen, started the Farm to Keiki (child) movement in Hawaiʻi as her way to give aloha back to her home. This program focuses on building life-long healthy eating habits of preschool-aged children by establishing their connection with nature and fresh, locally-grown foods while food preferences are developing. Cultivated in 2011, Farm to Keiki was piloted in 19 diverse preschools with 550 children on the island of Kaua’i and is now spreading statewide. The program supports early learning facilities to encourage young children to grow and taste local fruits and vegetables and build a relationship with the ‘āina. Farm to Keiki’s innovative strategy builds the awareness and capacity of teachers and parents to choose a path that brings the ‘āina and healthy lifestyles into children’s classrooms and homes. Farm to Keiki has successfully linked bridges across islands to bring early childcare stakeholders together statewide. Partners from over 40 state agencies, community organizations, child care centers and families are working to include Farm to Keiki and Let’s Move! Child Care goals into all avenues that reach young children. Recent funding from the Bill Healy Foundation has allowed Farm to Keiki and Kaua’i Community College to pioneer the first college program that specializes in training future early childhood education teachers to implement Farm to Preschool in childcare facilities. As best practices for teaching Farm to Preschool develop from the lectures and model preschool at the college, successes will be shared for statewide and national replication. Farm to Keiki uses the Aloha Spirit to create healthier lives for our keiki and our planet. We are all ‘ohana (family); let’s work together like one. In Douglas County, Kansas, early educators have embraced the Root for Food curriculum and are seeing their preschoolers enthused about trying new fruits and vegetables that they are growing in gardens. 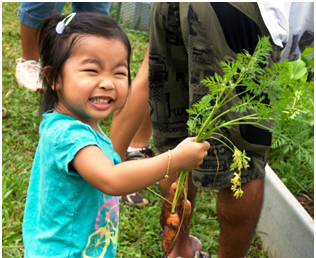 See how one center incorporates Farm to Keiki activities in their program — from gardening and cooking with kids to serving local food.